Having Trouble Finding the Right Information Quickly? Finding the right information quickly is an imperative function for all organizations, yet 75% of AIIM respondents said this is a challenge for them at work. One main cause is the overwhelming amount of costly legacy information systems and technologies that are difficult to modernize or connect to one another to make useful. Sound familiar? Are You Bottlenecking Your Digital Transformation? Are you planning to modernize your information management strategy with machine learning? You're not alone. According to AIIM research, 51% of organizations plan to spend “more” or “a lot more” in the next 18-24 months on their efforts to leverage analytics and machine learning. This task can be frustrating to tackle, and for this, we have a solution for you. The rapid increase of "Big Content" in the digital age has culminated an array of costly legacy information systems and technologies that store and manage content but with no way to modernize or connect to each other. This begs the question: How do you strategically modernize to move forward and also work – efficiently – in your multiple systems? How do you realize your ROI? Content Migration -- Go Manual? Or Find a Partner? Carefully think through the pros and cons of your approach to content migration. 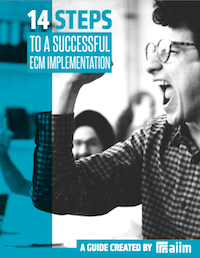 Yes, ECM needs a makeover. And yes, ECM capabilities are more critical than ever. Both are true. Yes, I know "ECM" is supposed to be passé now. Per Merriam-Webster, the three definitions of passé are: past one's time outmoded behind the times Now I would be among the first -- and have been saying so for the past three years -- to say that the "ECM" term is in need of a makeover. Witness the work we have been doing re Intelligent Information Management. My main concern is that I don't think the "ECM" term does justice to all of the incredible things people are doing with content and information. But that DOES NOT mean that content management capabilities are irrelevant; in fact they are more important than ever, albeit in new and changing forms. In the midst of all of the "ECM is dead" conversations, I recently participated in a very refreshing and passionate panel at one of the #IBMContent2017 summits. The two end user organizations on the panel took great objection to the "ECM is dead" conversation and insisted that rather than being dead, content management is more important than ever to their organizations -- and in fact, content management is a core enabling set of capabilities to everything they do and in their efforts to drive digital transformation in their organizations. These two organizations have been doing ECM at massive scale for a LONG time -- 3 decades -- and shared some important lessons about how their content management capabilities and requirements have changed over time, the lessons learned along the way - warts and all, and how they are continuing to morph their capabilities in the era of analytics. I was so impressed with their passion that I asked them whether they would be willing to recreate the conversation we had on a webinar so that it could be shared with a broader audience. And so that's what we're doing on August 9 at 2 pm eastern. Here are some of the topics we'll cover... How can you use a shared services approach to expand and evolve your initial content management investment? How do you “sell” – and deliver – content capabilities to the “business”? What does it mean when content management capabilities become mission critical – i.e., content systems can never go down? How do content management challenges change when the scale is massive – millions or billions of documents? How have the content and information management skills needed to support your operation changed over time? What comes next? How are you using analytics to push your content management investment to the next level? Join us at 2 pm on August 9. I can guarantee the conversation will be fun and energizing. You can register HERE or by clicking on the image below. Your legacy Enterprise Content Management (ECM) system has been a reliable part of your organization for years. It was cutting edge when it was implemented. But how do you know when it’s no longer flexible enough to help your business meet its vision and strategic goals?